Bourbon Street, New Orleans, 1995. Mark Steinmetz. Courtesy of Yancey Richardson Gallery. 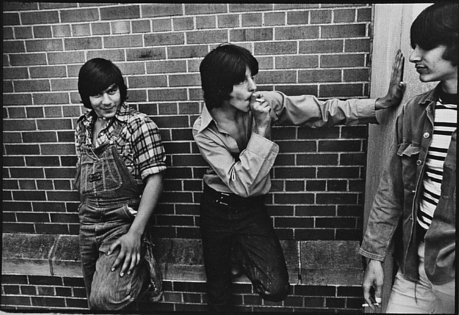 Smokin' by the School, 1976. 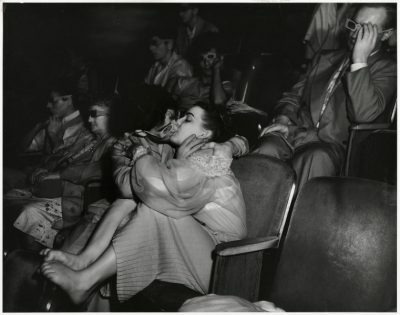 Joseph Szabo. Courtesy of Gitterman Gallery. 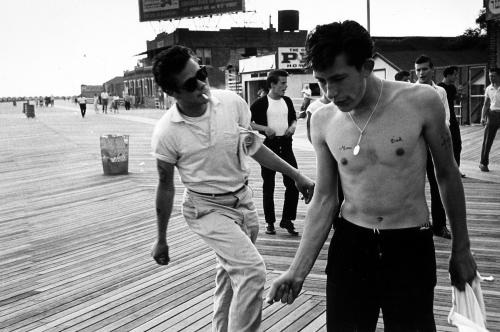 Brooklyn, Gang, (Gang Members Jiving on Boardwalk), 1959. Bruce Davidson. 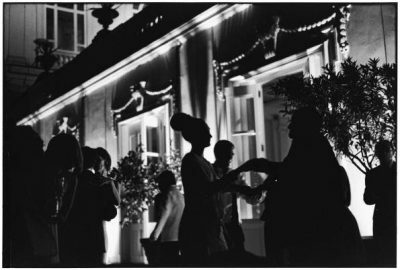 Courtesy of Howard Greenberg Gallery. Matt, Will, Henry and Ray, 2007. Collin LaFleche. Courtesy of ClampArt Gallery. Night Owls, 1971. 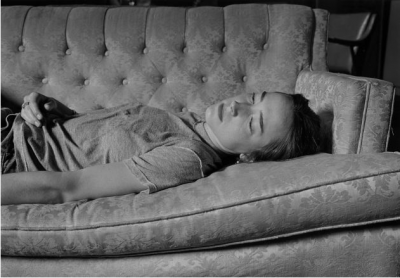 Joseph Szabo. Courtesy of Gitterman Gallery. Rome, 2005. Elliott Erwitt. Courtesy Jackson Fine Art. Girl and Boy Sit in Chairs on Porch, 1972. William Gedney. Courtesy of Rubenstein Rare Book & Manuscript Library, Duke University. Renee, Athens, Georgia, 2001. 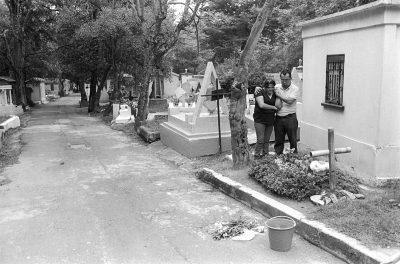 Mark Steinmetz. Courtesy of Yancey Richardson Gallery. Weegee, Couple Kissing at 3D Movie, circa 1945. Courtesy of Arlette and Gus Kayafas. Fantasy No. 1, 2004, Jen Davis. Courtesy of ClampArt Gallery. Jessica, Athens, Georigia, 1997. 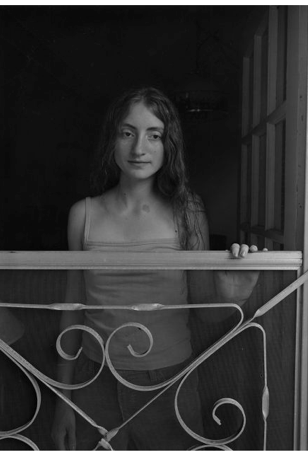 Mark Steinmetz. Courtesy of Yancey Richardson Gallery. 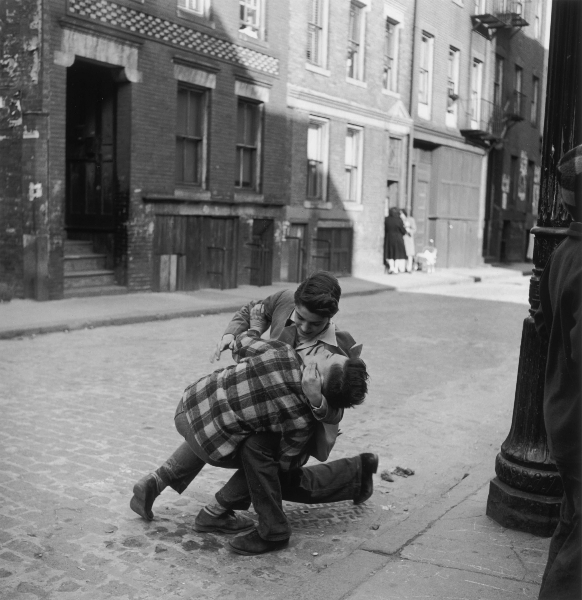 Boys Wrestling, West End, Boston, 1950. Jules Aarons. Courtesy of Arlette and Gus Kayafas. 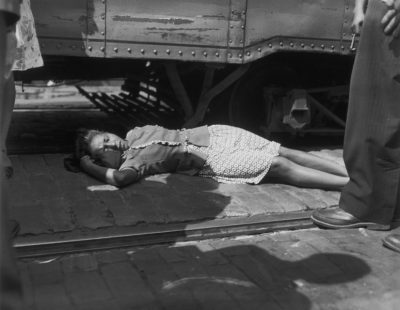 Woman Under Street Car, Pittsburgh, circa 1945. Teenie Harris. Courtesy of Arlette and Gus Kayafas. Man Lying on Stomach in Dirt while Another Walks on His Back. 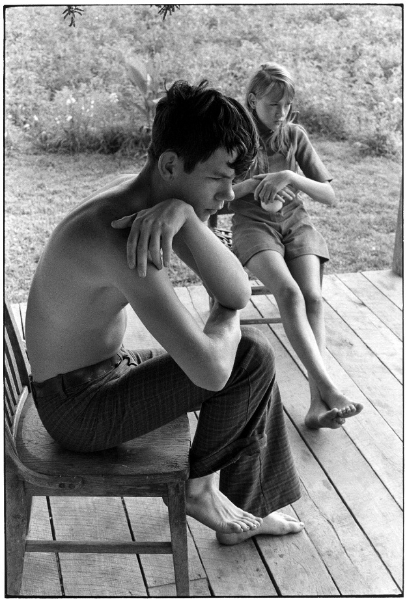 William Gedney. Courtesy of Richard Gedney. Ben, 2011. Manjari Sharma. Courtesy of ClampArt Gallery. 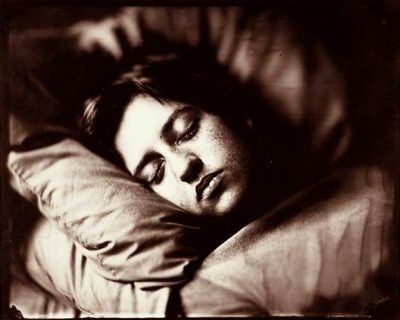 Claire, Morning Light, 2002. France Scully Osterman. Courtesy of Howard Greenberg Gallery. 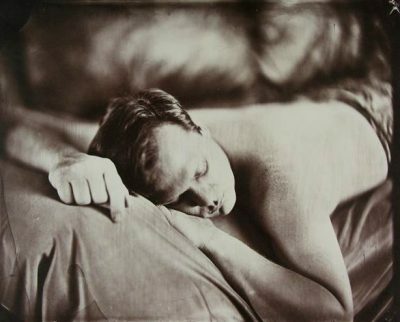 Sleeping (husband), 1998. France Scully Osterman. Courtesy of Howard Greenberg Gallery. 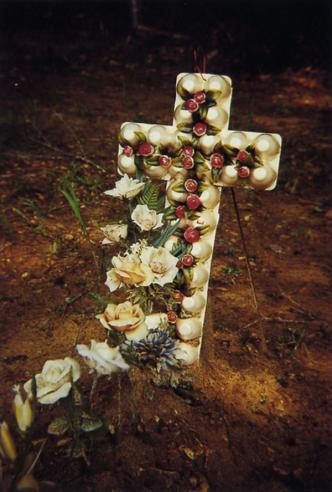 Egg Carton Cross, 1975. William Christenberry. Courtesy of Arlette and Gus Kayafas. 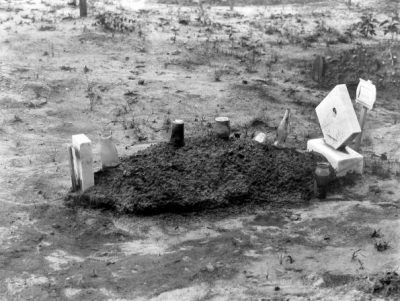 Child's Grave, Alabama. Walker Evans. Courtesy of Jackson Fine Art. Mexico City, 2013. Peter Kayafas. Sasha Wolf Gallery. Olhao-11 Algarve, Portugal, 2010. Robert Richfield. Courtesy of Arlette and Gus Kayafas. It is likely that none of the photographs included in this exhibition were made to illustrate Shakespeare’s Romeo & Juliet. It can be said, though, that each of them was made to address an essential aspect of the human condition, and what is the great genius of Shakespeare’s drama if not to provide universally relevant anecdotes for every imaginable human trait? The intention of this exhibition is to somewhat playfully address the long-standing resonance between words and pictures, and to acknowledge that this synergy is capable of creating something greater than the sum of its parts. The exhibition is assembled with the arc of the play in mind, and the photographs that are meant to evoke specific aspects of the drama—the fight scenes, the party scene, the balcony, consummation of love, the deaths of the protagonists, and their subsequent memorialization—are all chosen for their individual strength as well as their narrative capacities. 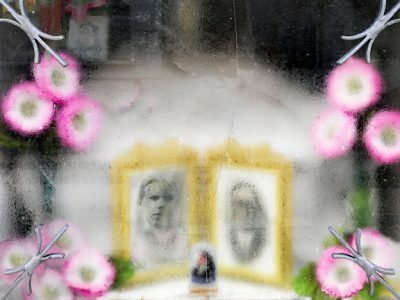 The viewer is being asked to consider how photographs can have a variety of meanings, and how images and well-known narratives can achieve new resonance when presented in different contexts. Co-curators Sasha Wolf and Peter Kayafas thank the following for contributing work to this exhibition: ClampArt Gallery, Richard Gedney, Gitterman Gallery, Howard Greenberg Gallery, Arlette and Gus Kayafas, Gallery Kayafas, Jackson Fine Art, Rubenstein Rare Book & Manuscript Library, Duke University, and Yancey Richardson Gallery.